From left, clockwise: HVS-490 Production Switcher, FRC-9000 Frame Rate Converter, and DSK-400 4K/HD Keyer Several of FOR-A’s 4K-supported solutions are being used for production of the 2018 Olympic Winter Games, including video and routing switcher, multiviewer, and video conversion technologies. Broadcasters in a number of countries, including the United States, Japan, and Korea are using FOR-A solutions for coverage. FOR-A’s frame rate convert technologies have been used in all recent Games, and one solution that is being used in PyeongChang is the FRC-9000 unit. The FRC-9000 frame rate converter features 4K/3G/HD/SD multi-format support and conversion with motion-compensation processing, and offers the option to upgrade to dual channel conversion in 3G/HD-SDI and store up to two Dolby E encoder/decoder optional modules. FOR-A products being used in 4K production systems include both the HVS-490 and HVS-2000 video switchers. 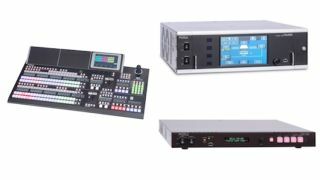 Offering an extensive feature set that allows for creativity in video switching, the HVS-490 production switcher enables more affordable 4K production. Thanks to its compact size, the HVS-490 is suitable for mobile production and live event venues where space is limited but production quality is critical, such as for broadcasters at the PyeongChang Games. The HVS-2000 switcher offers capabilities including MELite, which allows a traditional AUX bus to transform into a functional M/E with cut, mix, wipe, and key control; FLEXaKEY, which enables operators to tailor their production needs by adding and moving key and DVE layers to traditional M/E resources or to MELite resources; and its panel memory system, P-MEM, which includes simple panel snapshot recall for events, sequence, and macro memory recalls.